For years, British journalist Cash Peters trekked around Europe and America visiting some of the tackiest attractions in the world for his hugely popular public-radio series, The Bad Taste Tours. But a guy can only take so much. Now, as Peters prepares to leave his travel-reporting days behind forever, he takes us along on some of the more ridiculous journeys and adventures of his career. Good-bye, Kansas Barbed Wire Museum; au revoir, Paris sewer system tour; auf Wiedersehen, Sound of Music locations tour. Join Peters on this outrageous behind-the-scenes look at the frustrations of a travel reporter on the road. Marvel at his ongoing battle with PR people and at his fights with men dressed in foam costumes, and gloat because you don't have to visit the Museum of Bad Art, the Precious Moments Theme Park, or the Museum of Dirt - and he does. ©2003 Cash Peters (P)2007 Blackstone Audio Inc. He tells it with much enthusiasm which certainly adds to the book. Amusing enough but ultimately a very pointless non event. The content is fine hence the two stars rather than one. I would quite like to read the book for myself since I find the places he visits quite interesting but I found the delivery quite unbearable. Every - single - word - is - emphasised often accompanied with pseudo laughter. The writer is a radio reporter and his style is probably good for his five minute reports but found it intensely irritating and abandoned after three half hour listens. Listen before you buy and if you like the delivery style you will probably enjoy the book. What did you like most about Gullible's Travels? Not knowing what to expect and being more than pleasantly surprised. It made me laugh. Cash Peters himself with his off the wall outlook and views. Have you listened to any of Cash Peters’s other performances? How does this one compare? Only moved me to laughter through most of the book - especially the visit to Graceland !!! What a wonderful 'find' in the audiobook selection. More where that came from wouldn't go amiss. 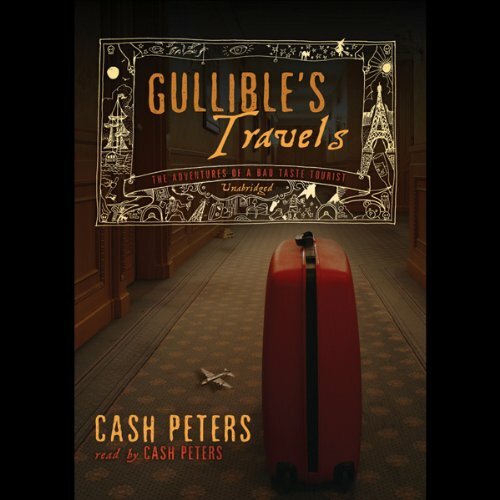 An audio book about the goofy travels of a goofy reporter named Cash Peters. Its entertaining and informative, and he does make some good/funny observations. The ending almost has a love story to it (almost). He does wrap it up well. It kept my interest and I did laugh. Warning: Cash Peter’s own voice can get a bit wearing after awhile (goofy), so you may need to break up listening sessions. Blackstone Audiobooks is my favorite audiobook publisher, the books from BA are usually better than expected (and sometimes a bit different than expected). I had had this book on my wishlist for some time but the cover photo and title had put me off a bit. I was not disaponted, this guy is so funny, he could do standup comedy. Cash Peters makes me think of Adrian Mole. This book could be made into a pretty good film. In the 1st 10 minutes, I thought I would hate it because it starts quite quickly and I didn't feel like the story had been set up. But after that, I definitely got into the story and found it quite amusing. Funny accounts of his odd travels. It did get a bit long at the end. The majority of the stories are funny but he could go on for hours and hours and after so many hours, you've heard just about all their is too hear of odd museum adventures. But I would recommend it. Definitely made me laugh.